Welcome to my June 2013 income report! Each month I write a detailed report about the progress of my businesses – from what’s working to what’s not. I include a financial report revealing exactly how much I’ve earned and where it all came from, and how much money I’ve spent too. I do these reports for several reasons. I believe in total transparency online and I also know these reports are inspirational to many. Most importantly, however, I write these reports because I feel that if a person is talking about online business and making money online, it’s only right to show how much money is actually being made. Companies with public stock share quarterly earnings reports to give their investors and potential investors a snapshot of how the business is going. Only then can those people make an education decision whether or not to invest (or keep investing) in that company. I don’t ask you to invest money in my company like with stocks, but I know you’re investing time with me. You’re investing time to read these posts, listen to my podcasts and watch my videos – and most importantly you’re investing time to implement these strategies and tactics that I share. Creating an online business and earning a passive income online isn’t easy. In fact, it’s downright difficult and not everyone who attempts to build a business online will succeed. Most will fail. You will see the lessons learned and earnings report below and I want you to know none of this happened overnight. Ask any successful entrepreneur and they’ll tell you the same story – none of what they earned happened overnight. But it did happen, and over time with the right guidance it can happen to you too. I hope I can give you the inspiration and guidance you need to give you the best chance to make things happen. Thanks so much, and enjoy this month’s report! I got more work done in June than I ever have in any other month since I started going business online. On June 17th I celebrated Let Go Day, which marked the 5 year anniversary of my lay off in 2008. To celebrate, I conducted a large-scale coordinated effort between several blogs and podcasts to publish guest posts and interviews (21 in total) all on the same day. For a couple of days prior, I was conducting interviews every half hour for 8 hours in a row. It was actually really fun! I also hosted a 2-hour live stream celebration that saw over 2000 different people stop by for some fun Q&A and giveaways. This helped push book sales up a little bit (it jumped from #14,999 in the Kindle store all the way up to #2,010), but more importantly I was able to get the Let Go story, including a free audio version that I was giving away, in front of thousands of brand new people, which was the goal. All in all, Let Go Day was a huge success! When the first Niche Site Duel happened between 2010-2011, it was a huge success. I was able to built a site from scratch publicly on here on the blog, get it ranking in Google and earning an income within 3 months. But, there was one part of that case study that was a major failure: how I organized getting other people involved. All I had was a page where I would link to other people’s updates on their own blogs, and that’s it. No accountability, no way to view people’s progress, and no line of communication between participants. A big goal of mine for Niche Site Duel 2.0, which I just started, is to do a better job of getting participants involved. In June, NicheSiteDuel.com launched…and it’s beautiful. Previously, that domain redirected to a Niche Site Duel archive page here on the blog, but now it’s a standalone, full-blown leaderboard and forum that acts as the hub for anyone building their own niche sites and following the Niche Site Duel 2.0 journey. There are already over 1500 people registered, thousands of comments and a ton of people who are already sharing their progress, questions and victories in the discussion forum – it’s awesome! The actual leaderboard where people can register their niche site’s target keyword and url (which remain hidden) currently ranks people based on when they sign up, but I’m working on including the ability for the leaderboard to automatically (yes, automatically!) generate keyword ranking in Google, Alexa ranking, number of indexed pages, age of domain and more. Then, the rankings will actually be based on progression. Related to Niche Site Duel 2.0, I read through a total of 622 applications and narrowed them down to a final group of 6 people for what I’m calling a Mastermind Learning Group (MLG). The purpose of creating the MLG is to highlight a group of NSD2.0 participants who will work closely with me and meet regularly every few weeks as they build up their niche sites to share their progress and results here publicly on the blog. So, instead of just my own case study, you’ll be able to follow along with 6 other people in close detail too. Participants were chosen not just based on the keyword and market that they chose and decided to build a website for, but for their personality and how they rounded out and diversified the overall MLG. For example, the group members are both male and female, young and old, local and international, experienced and not experienced with building websites online, etc. It took a lot longer than expect to narrow down the group to one that I felt would be best suited for the SPI audience to learn from, but at the same time, it was an incredibly fun process. Thank you to those of you who submitted an application – it was an absolutely pleasure to get to know each and everyone one of you through the responses to your questions. What is the target keyword you selected and why did you choose it? Why do you REALLY want to become a part of the Mastermind Learning Group? What is your favorite childhood memory, and why? You and me end up sitting next to each other on a 3-hour bus ride somewhere. I’m a great listener. Besides anything business or blogging related, what could you talk to me about for the entire ride? What’s an interesting habit you have? These questions really helped me to understand truly what kind of person was applying and what kinds of values they had. Like I said, reading the answers to these questions took a lot longer than expected, but it was worth every minute and probably one of the most fulfilling things I’ve done all year. The MLG group members will be highlighted quite often during the upcoming NSD2.0 posts. At first, their target markets will be revealed but their exact keyword and URL will not. I don’t want their public participation in NSD2.0 to give them a surface-level advantage over other participants. In other words, I don’t want the fact that they revealed their URL to help them get more backlinks and more traffic and attention than they would have if they did not – because their results would be arguably skewed. June 2013 was the worst month for earnings since August of 2011 for securityguardtraininghq.com. Although it still earned roughly $1,500 with zero hours of work, it did earn $1000 less than the previous reported month. Some up-and-down is expected, but $1000 is a significant loss. Let’s see if we can dissect why? Let’s look at where the earnings are coming from. In Adsense, which is the primary income source for this site, click-through-rate and cost-per-click were normal, but pageviews was significantly less. 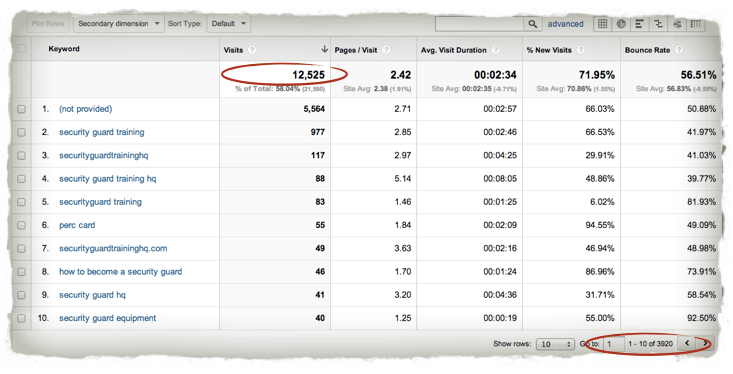 In May 2013, for example, specific ad channels for this niche site saw a total of 131,760 pageviews. 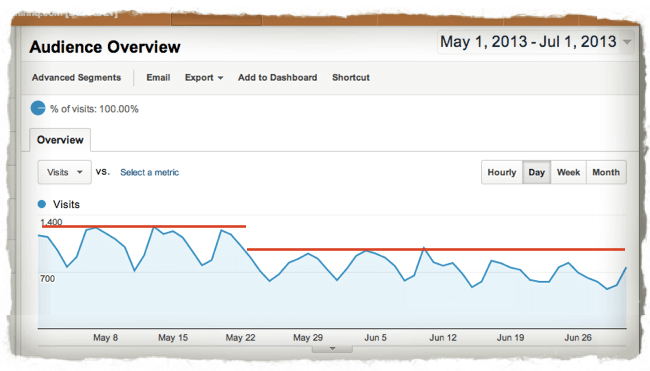 In June, there were only 93,195 total pageviews – a 30% loss. Let’s look at the traffic. In May 2013, a total of 30,055 people visited the site. In June 2013, a total of 21,580 people visited the site – a 29% loss. Let’s look at the traffic sources. It’s clear that most of my traffic comes from organic searches in Google. 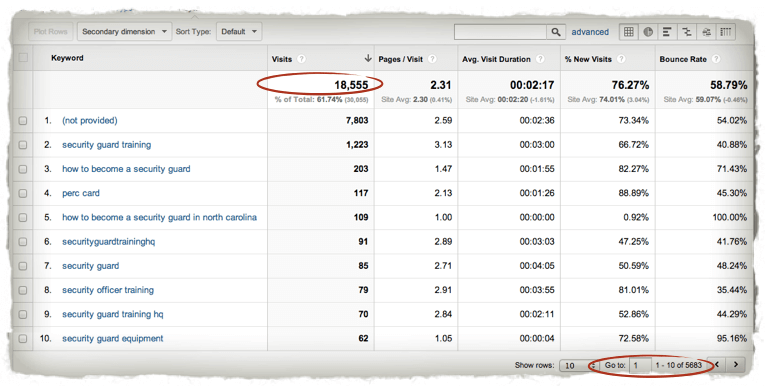 In May, a total of 18,555 people visited my site from Google searches. In June, that total is only 12,525. Another thing that’s significant is the decrease in the number of long tail keywords that the site is being found for. This is important because the site actually got most of its traffic from long tail keyword searches – not its primary keyword, security guard training. In May, the site was found by 5,683 total different keywords. In June, the site was found only by 3,920 total different keywords – a 30% loss. This is the first month ever that the total number of different keywords that the site has been found for went down by more than 8%. So the earnings went down – due to the traffic, which was due to organic search engine traffic. So naturally, we’ll want to see what happened to the rankings. I started this site almost exactly 3 years ago, and for the past 2.5 years it has enjoyed a comfortable and reliable spot at the #1 spot in Google for its target keyword. Recently, however, it’s starting to see a lot of really wacky activity on the search engine results pages. Each day after the sudden drop, the site came back to the #1 position. I don’t understand exactly why this is happening, but I do know that Google has come out with even more algorithm changes lately – and fairly significant ones too. In late May, Google rolled out with Penguin 2.0. It’s the 4th iteration of the update which tackles webspam, but the first actual algorithm update that was beyond just a data refresh. If you don’t know what that means, don’t worry. All it means is that spammy sites are being targeted more and more, as explained by Matt Cutts here. Another update that was recently rolled out has to do with PMDs (partial-match domains). This seems like an extension of Google’s EMD (exact-match domain) update, which targets low-quality sites that were getting favorable rankings due to having the keyword they wanted to rank for in their domain name. This update doesn’t mean you should avoid using keywords in your domain name – it just means that you can’t and shouldn’t rely on keywords in the domain name to directly improve search engines rankings. It’ll be interesting to see what happens with securityguardtraininghq.com. The site has successfully generated over $50,000 in revenue since 2010, but I will admit that the tactics that were used to rank the site back then I would avoid using in today’s search engine environment. The strategies still work, but the chances of them working are slim and it’s easy to put yourself at risk to become an easy target for Google. This is why I’m really excited for Niche Site Duel 2.0. I plan to take a completely different approach when it comes to marketing and backlinking for the website I will built. Hopefully Google will reward the approach. I guess we’ll see! Also, please note that a lot of these are figures from reports from each individual company for the previous month. It does not necessarily reflect the actual payment which, for some of the companies listed below, come 30 to 60 days later and may change because of potential refunds or corrections. Expenses do not include pro-rated yearly fees. Most are related to the Smart Passive Income Blog and new projects that are currently under development. I’ll be the first to admit that a significant portion of my total online income comes as a result of The Smart Passive Income Blog – mostly from the products that I recommend as an affiliate, which are products I’ve used or am extremely familiar with and have helped me in one way, shape or form. When I first started this blog back in 2008, I never intended to make any money from it. If you go back to my earlier income reports you’ll see that all of my income was coming from outside of this blog through other businesses. Over time, however, the SPI community has grown and as a byproduct of being helpful and giving away as much as possible, I started earning from this site too. Because I believe in total honesty and transparency, I decided to include the income from SPI on these reports as well. It wouldn’t feel right hiding this from you. My non-SPI related income has hovered around the $10,000/month mark for the past year, which is much more than I ever made working my 9 to 5 job in architecture, but I’m truly blessed that I have the support from an amazing community here at SPI who is willing to pay me back for all of the information I publish and the help that I try to provide for free. Some people go out of their way to make sure I get credit for an affiliate link, often emailing me to make sure I got it, which means the world to me. Thank you so much! With this type of community comes great responsibility and I will never take it for granted. I will never promote something just for the potential income that can come from an affiliate offer, even though those opportunities are definitely there. I’m incredibly grateful for everything and I will continue to give back with valuable content and my experience in return. Last month, I shared that I had to let go of both of my virtual assistants. They were from the Philippines and they were amazing – the work they did was always done well and done on time – but unfortunately, the tasks that I hired them to do I didn’t need done anymore, so I had to let them go. Although they were excellent assistants and completely loyal, what I felt was missing with my virtual assistant experience were people that were totally 100% in tune with my business, what I was doing and where I wanted to go with it; people who could think about the future of SPI and all of the projects I was working on and actually feel comfortable speaking up and offering their own opinion or thoughts about it, with the ability to shape where it was going. What was missing were team members that were big thinkers and big doers, as opposed to virtual assistants who just completed tasks that I fed to them. I wanted to experience a team that would create and complete tasks of their own to meet specific company goals. In June, I think found my team and it’s been the most amazing experience working together with them. I wouldn’t have been able to get half, or even a quarter of what was done without them, and I owe most of what was accomplished in June to them. This includes coordinating Let Go Day, the entire NicheSiteDuel.com leaderboard and discussion forum, and my new course, Breakthrough Blogging, which I’ll talk more about in July’s income report, since that launched on July 1st. The team consists of a project manager, who allows me to stop worrying about putting all the pieces together and just focus on what I need to focus on. He utilizes a designer and a developer that we have on the team as well, plus a general support person who is there to pick up the pieces. We also have a videographer on the team as well. They are far more expensive than working with virtual assistants from the Philippines (hence the larger than normal expense report) – but the team’s ability to work together to get things done is definitely worth the price. SO much of the work and thinking is lefted off of my shoulders, and it’s amazing. Currently they aren’t employees, but when there’s a project that needs to be done we all work on it together, and we also share the rewards too. Hiring a team like this isn’t something that everyone can do, especially right away, but I know this is something I should have done a long time ago with how fast SPI has grown. Although there are things they do that I wouldn’t mind doing myself, I’ve grown to a point where I need to hand those types of things off and focus on what I know I need to focus on. As a result of working with this team (and currently they are contractors who work for me on a project-by-project basis), look out for more, bigger idea type things from SPI that will be there to help you. The next thing on our list is converting SPI from what it looks like now to the new and improved design, which is already complete – it just needs to be coded, tested and then turned on. I hope this get this implemented by the end of July, so look out for that! Thanks again for reading this month’s report!